Despite my often-stated Not Knowing What I'm Doing, sometimes friends are around who want to play on bikes and there's no-one with The Know kicking around to assume a position of authority and show us where to go. Since I live here, naturally I'm the fallback leader in such situations (and I hope the idea of me leading a ride even of only two people amuses you as much as it amuses me). I have to say, I think that due to lack of planning on my part I can't really call the two expeditions I have under my belt complete successes, but I think there was more success than fail. The first one was with Ian (hi, Ian!) who got the train over to Oxford a couple of weekends ago. I managed to start this one pretty badly by being late to the station. D'oh. Apologies out of the way, I made some more apologies pretty quickly: I hadn't found the time to ride all (or even most) of the route before, and some of it was a complete guess as to whether it was rideable or not. There were definitely rideable and fun bits in there that I'd been to with the club, but there were also some sketchy paths that were marked but for all I knew could be ploughed fields. 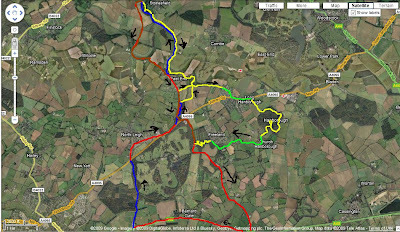 Plan B was to take roads to the bits I was more confident about being both rideable and easily findable. But Ian was cool with exploring and, hey, we had all afternoon. We set off up the Thames path in search of a pub to get some lunch from. The Thames path runs from pretty much round the back of Oxford station to the edge of the village, and while it's flat (being a path next to the Thames what else would you expect?) it's still more enjoyable than riding along the road. The weather was glorious, so the ride up from the station to the Trout was extremely pleasant. We stopped off at the pub, ordered some burgers (tasty) and chips (so-so), and had a chat about where we were headed. Since we'd have another five miles-ish of riding along the river, we figured digesting wouldn't be a problem. After lunch as we left the more well-travelled part of the path, the realisation hit us that the ripply floodplain surface of the ground, baked by the sun over a fortnight of no rain, was going to prove a bit of a boneshaker. Not a fun boneshaker. Just a bit sapping. On top of that, the sun was just unbelievably hot. It was a great relief when we got back into the shade of some trees. Reaching the 'Sham, we cycled straight through to Chill Bridge Lane, and off the end of it onto a bridleway which connected us up to a minor road west of the village. Not a particularly interesting bridleway, and honestly I can't remember anything about it at this point. Apart from it'd been diverted down the edge of a field on one section. Once on the road again we were looking out for a right onto one of the total unknown tracks on the map. We found it... straight over the middle of a field. It wasn't so much a trail as a line of cleared vegetation across a once-ploughed (and baked solid) surface. I take back what I said about the thames path being a boneshaker; this really, really was. Didn't last too long before getting into more of a trail, though, once we were across the field. It didn't seem well frequented by anyone except horse riders though, and the terrain really didn't smooth out that much. The surface was just about dry, and I guess at any other time of year it would've just been a mud bath. Again, not so much fun as hard work, though. Out of the other end of this, we had another short section of road before picking up the next path - or so I thought. We took one look at the nonexistent path and decided to make for the next one along. And then we did the same again. Third path along, we decided to have a go. The problem was, the actual route of the path was... ambiguous. We set off up a likely looking trail that seemed approximately right only to find it terminated in a dense thicket. Bugger. Looking down across the field next to us, it seemed there was a gap in the hedge... so back we went to the start of the path and tried again, going the opposite way around the field. Again, no joy. I got off and had a walk... turns out the path runs directly through the middle of the field. Bah. So we plodded along the edge, through the gap, and then round the edge of the next field onto the path leading up to the road. Here we were planning to cross over the A40 and go on a bridleway past the western side of the parkand of Eynsham hall. Cleverly, though, I chose this moment to notice the wide variety of thorny twigs I'd managed to collect in my tyres. My back wheel was fine, but pulling the thorns from the front rewarded me with multiple hisses. I was packing a couple of spare tubes, though, so all was well... Until we found that Ian had two flats, no repair kit and only one spare tube. And needed tubes with different valves to me. I hightailed it back along the A40 to Eynsham to the magic hardware shop to buy more tubes, and Ian followed as best he could. The shop was crazy busy, so it took me a while, and as I headed back out of the village with the spares, I met Ian on his way back. We replaced his other tube, and decided not to bother going back out to another potentially unknown bridleway and instead to take the roads up to Stonesfield to go to the quarry I've written about before. We got up there, belted down the bridleway, crossed the river and climbed up through the wood to the top of the quarry I've fretted publicly here about riding before (from the opposite side to the one I first rode). From behind me, I heard the sound of quiet expletives. Apparently, it looks one hell of a lot bigger in real life than in photos. To his credit, though, Ian rode it. After a brief stop in the bottom of the bowl to look up and marvel about our continued survival, it was time to head down the rest of the descent - which for my money is actually more worrying and difficult than the chute. It's a longer but shallower (still very steep) slope which ends in a sharp left. If you don't make the turn, you plough straight into a fence. Since it's longer you have plenty of room to balls it up, and you actually have to control the speed of the bike so you can make the corner at the foot of the slope - and on top of that, it's quite a loose surface, so you don't get that much grip when you start braking before you're skidding down the slope rather than rolling down it. A brief run along the foot of the hill, and we climbed back up and round to the quarry again, this time from the opposite side. From this approach, the descent after the chute is longer, smoother, straighter and much more zoomable. So rather than stopping, we just flew down, through the bowl without stopping, and down the trail back out of the wood and to the bridge over the river in a lovely, flowing blast. We went back up the bridleway we came down, headed back into East End, and picked up the bridleway across to Hanborough. This is a nice, undulating trail - not amazing, but pleasant. As we reached the other end, Ian ran out of water and we noticed the light was beginning to go. The time had come to head back to the village on the roads, and then on to Oxford so Ian could get the train back home. I must confess, one of the other problems with not planning the route was the unexpected length. Over 30 miles for Ian and probably about 40 for me! Oops. I promise I'll plan something saner next time! This Wednesday I had my chance to rectify some of my poor route choices, as Claire had agreed to come over for a ride. After we'd arranged this I found out that I had to be in the office in the day, so we were looking at doing the whole thing in the dark. This was a bit of a worry for me, since I'd be leading and still (still!) failed to go out and properly figure out the route beforehand. I was planning to stick to stuff I'd ridden at least once before (if not necessarily in the same direction), though, so I thought the worst case would be the occasional overshoot, missed turning or accidental cutoff of interesting sections. Wednesday came, and I found that the main feature of the ride was not to be my dodgy guiding, but instead Mud. After three weeks or so of little-or-no rain, it absolutely tipped it down all day. But, we'd done Arranging and everything, so off we went. I decided after the ride with Ian that nothing south of the A40 was really worth the effort, and curious to ride the bridleway by Eynsham Hall that I'd planned to go up with him, we headed out on the cycle path alongside the A40. I'd been down the trail we were heading to a couple of weeks previously after a club ride - they pointed me down it as they were heading off back to Witney with the advice "watch out: there's a couple of muddy, rutty sections, so don't go too fast. Other than that, it's fine. Oh, apart from the deer. Try not to hit any deer." I hadn't found it too bad, though there were indeed some muddy sections even after all the good weather and the ruts were definitely worth being wary of. So on this occasion, I was hoping that the mud hadn't become too horrific. It was certainly tougher going; between ruts and roots and mud, the bike was sliding around a fair bit, and there were a couple of points where going slightly off-piste was the only viable choice. I was finding it pretty fun, though. Claire was... maybe not having so much fun. Despite having a much more expensive lighting set-up than me, it wasn't working so well. On top of that, she seemed to be having more trouble with the mud than me. I dunno if that's because I've ridden on more mud or because of her bike (fancy full-sus affair, but something was amis with the drivetrain; she was having trouble with it jumping gears unexpectedly from time to time). The trail climbs gently from a farm, rolls down for a while, then climbs back up to the road. Very very light gradients, but still a reasonably fun route. I think I actually preferred the muddy version, oddly. Professional, eh? You should probably definitely not try to use that as a workable map, by the way. Much of it was drawn by me going "er... well I know there's a trail somewhere there that connects up to somewhere over here..." and so some of it (especially the yellow sections) are Highly Dubious. So, what have I learned? Mostly that I should plan my routes more! Also, I don't know my way around that well still. But it's getting there! By next summer, hopefully I should be able to give any visitors a reasonably entertaining tour provided they're not expecting anything too adrenaline-y or technical - and there's a couple of bits of trail further to the North West I'd like to link into a bigger loop like this, I just need to figure out how to do so (and where exactly they are). Thanks to Ian and Claire for coming through and putting up with my dodgy route planning - I had a lot of fun, and I hope you both did too! Will you fix it for me to know why we have such stupid, restrictive laws in England which prevent cyclists from using the vast majority of the public rights of way network? I was wondering what your position is (if any) on the right of access to the countryside by cyclists and specifically a change in the law allowing cyclists to use footpaths. As it stands, in England cyclists have access to only about 20% of all public rights of way, with the vast majority being footpaths and therefore off-limits no matter that most footpaths are perfectly suitable for cycling along. When compared with the Scottish system (cyclists and walkers sharing all the same routes with no discrimination), the English legislation seems needlessly proscriptive, and given it's an aim to get people more active and to use sustainable transport more, seems positively obstructive for no good reason. Provided that cyclists are required to cycle responsibly (as in Scotland), I don't see any rational argument against allowing them to use footpaths. Bicycles don't cause any more erosion of trails than walkers do, and judging by the Scottish system, even near major cities such as Edinburgh cyclists and pedestrians seem perfectly capable of co-existing on the same paths without trouble - as they already do on bridleways and other byways in England. Just not footpaths, for some arbitrary reason. I should make it clear I'm talking about right-of-way footpaths only, not pavements next to highways. Imagine my glee when I got a reply in a fancy Houses of Parliament envelope! Thank you for your email dated 16 Septmeber 2009 about changing the law to allow cyclists to use right-of-way footpaths. I can understand why you feel the current system is unfair to cyclists. As you mention, whilst legislation currently allows cyclists to use bridal[sic] paths, they are not permitted to use right-of-way footpaths, which are reserved for pedestrians. There are problems with changing existing legislation to allow cyclists to use all right-of-way footpaths. Whilst many of these footpaths may be suitable for cyclists, others are not and allowing cyclists to use them could have significant safety implications for both themselves and pedestrians. I do certainly think that local authorities should encourage landowners to volunteer to allow cyclists to use footpaths that run through their land. Similar initiatives have been used successfully around the country, and I believe this is a more cost-effective, local solution of opening up the countryside to cyclists. I am a keen cyclist myself and encouraging people to cycle more will be a major priority for a future Conservative Government. My party will reform the much-criticised Transport Innovation Fund, to free local authorities to use £200 million a year to encourage the development of new green transport schemes such as cycle routes and corridors. These measures will help improve road safety and promote cycling as a safe alternative means of travel. So, first of all, thanks to David Cameron for taking the time to reply. But I don't really agree with any of the reasons he gives for maintaining the status quo. I'll get my thoughts in order, then post my criticisms in a bit. I may even write back (not that I think it'll do much good), so if you have any evidence/arguments you think I should include then let me know. Or, if you particularly want to, write to your own MP. Yes, even if you're in Scotland, since hilariously your MP in Westminster gets to have a say on English laws even if my MP doesn't get a say on Scottish laws.